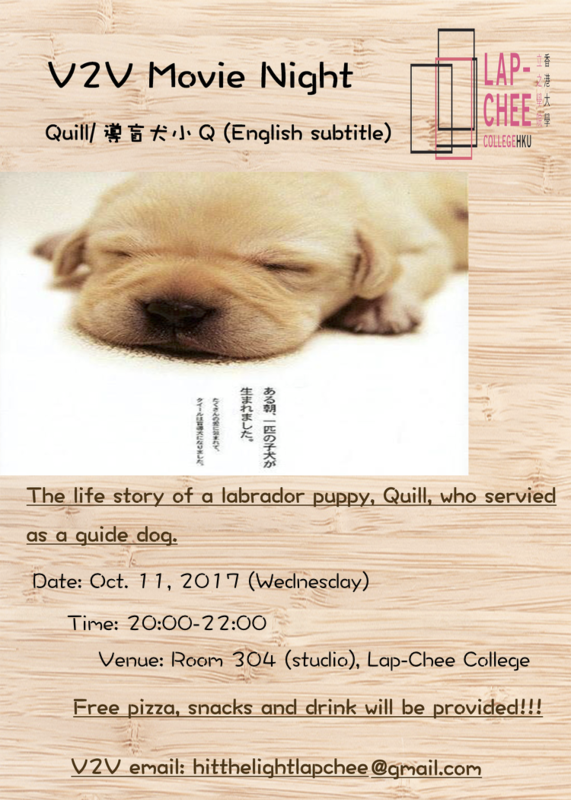 You are warmly welcomed to join the movie night by V2V club of Lap-Chee College. As a Labrador puppy, Quill is sent to live with a couple, Isamu and Mitsuko Nii, who work as volunteers, training guide dogs (seeing eye dogs). When he grows to an adult dog, he is taken to a guide dog school, by a friendly, yet firm trainer Satoru Tawada. Although Quill is a little slower than the other dogs at the school, he seems to have an unusual ’empathy’ and remarkable patience with his trainers. Tawade decides that Quill would be the ideal guide dog for Mitsuru Watanabe, but Wanatabe, a lonely and ill-tempered middle aged man, isn’t as enthusiastic – he would “would rather sleep than be dragged around by a dog.”. From here, the story is narrated by Wanatabe’s daughter, Mitsuko, and slowly, Wantanbe is rehabilitated, venturing into the outside world, and learning, not only to trust other humans, but the animal at his side who guides him. Village-to-Village Program is a program under Lap-Chee College, which mainly focuses on exploring more possibilities in careers for the teenagers with visual impairment. We will achieve this goal through several steps, for example, enhancing our understanding about their current living conditions, improving the services and providing more career information to them as well as stirring their enthusiasm for grasping new skills. Furthermore, we are preparing to arouse public awareness of those teenagers with visual impairment, especially in universities. All Jockey Club Student Village III residents and members of the HKU community are welcome. More importantly, pizza, snacks and drink will be provided!! !